Typically, children in slums are depicted as having few opportunities to be able to break free from the cycle of poverty that they have been born into. It is a common assumption that slum kids spend their time doing menial jobs, do not go to school, engage in various levels of petty crime and largely depend on charity to be able to achieve a better life. Little attention is directed to the real game changers in these areas: those who were born and brought up in the slum and have made it their lifelong mission to be able to support children who cannot afford to go to school and have no ways of passing their days in a productive way. It is first and foremost these people and their endeavours in the community that should be supported in their quest to raise the standard of living of those who live in informal marginalised settlements. 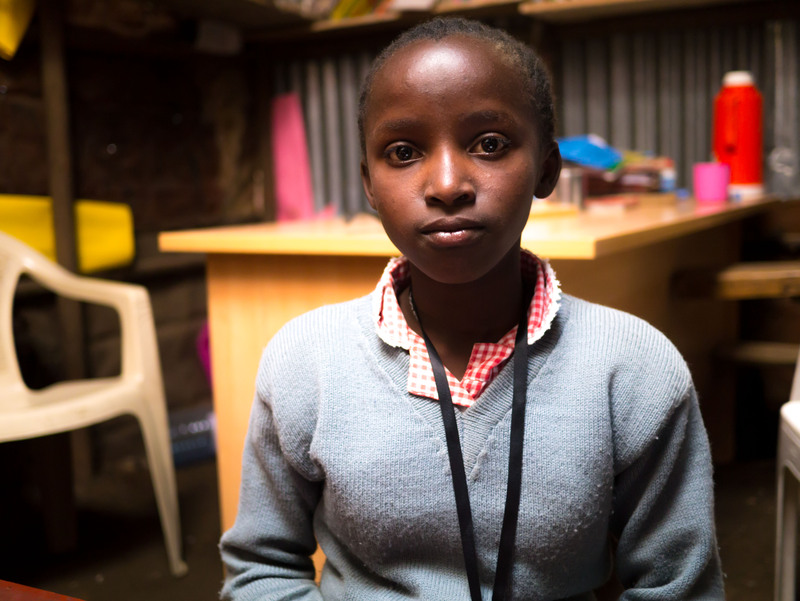 This week, as part of our children in slums topic, we are describing a day in the life of Tina Turner Warimu, a child who, with the help of one such mentor and her own determination, has begun to pave the road for a bright future which holds promise and hope. 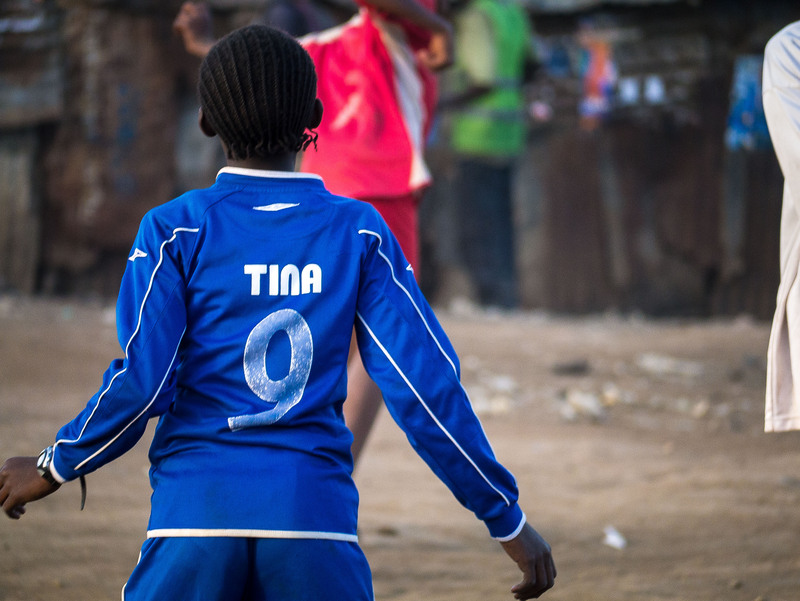 Tina Turner Wairimu is a 13-year-old girl who lives in Mathare with her mother and four younger siblings. She attends a small private school called Destiny Junior Academy and is in Standard Seven (9th grade). One of the top students in her class, Tina is also a fiercely competitive football (soccer) player and is the captain of the local True Colours under-sixteen girls’ team. Tina’s daily routine is very tight and leaves little space for idle play. Awake at 6:30am, she must first bathe inside the single room the entire family lives in with the water her mother buys every day. As the oldest child, she gets to bathe first while her younger siblings wait their turn outside. After her morning ablutions, Tina takes tea with milk but no sugar and a piece of white bread. Next she rushes off to school on her own while her mother sets off to work in a local laundry service where clothes are washed by hand. Tina recently changed schools. Until December last year she attended Valley View Academy, a larger private school in Mathare that is a slightly longer walk from her home. Although her siblings still attend Valley View, Tina decided to change because her coach, Austin Ajowi, recently founded Destiny Junior Academy and she felt she would be happy attending a school that was run by him. 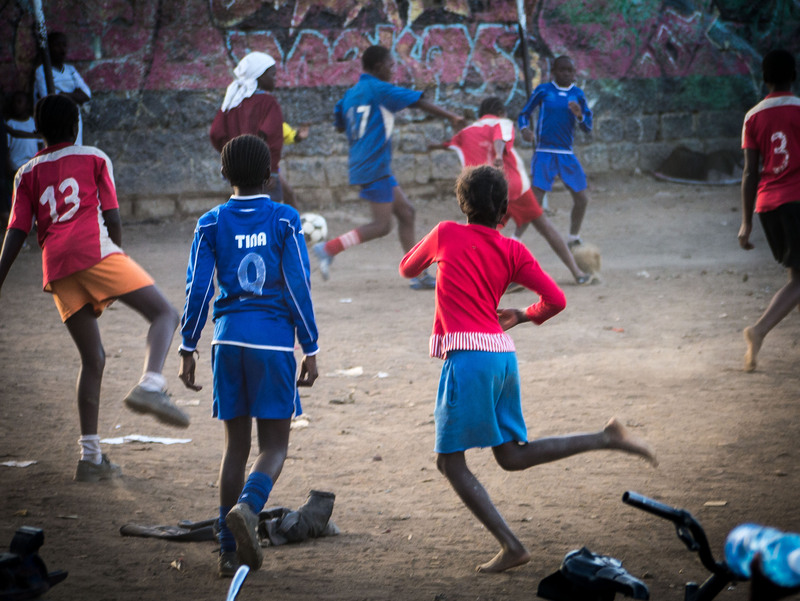 Ajowi, 36, known locally as “Coaches,” is a widely celebrated and respected man around Mathare. He single-handedly founded the True Colours football club almost ten years ago when he decided he wanted to find something to keep the local out-of-school street kids busy. Since then, the club has expanded, and Ajowi currently coaches 15 different female and male junior and professional teams who play in tournaments around the country. Ajowi worked as a volunteer at Valley View Academy for a few years before deciding he wanted to found a school of his own. With the help of dedicated young teachers from the area, Ajowi set up a small school with six classrooms, all of which are packed with students eager to learn. The school charges the students a small fee, but those who cannot afford to pay can continue to attend class. In addition to this, the school receives informal funding from friends and well-wishers who want to see it grow and prosper. Tina spends a good part of her day, from 8am to 5pm, at school. She loves school because she can spend time with her friends and continue learning science, which is by far her favourite subject. The reason she likes science is because she wants to learn about the environment, which she believes is important because, in her words, “It is the air we breathe which must be kept clean if we want our planet to be healthy.” Tina dreams of becoming an air hostess and travelling the world. Six days a week Tina goes to football practice when she gets out of school. Tina takes her duties as team captain very seriously because it means she takes care of her teammates, and also because when they win, she is the one who gets the most attention.Tina will be trying out for a Norwegian female junior team in the coming months; if she is selected, it will mean having to leave home to pursue football as a professional player. Tina is excited at the idea of being able to travel to Europe, although she is afraid she will miss her mother and brothers and sisters. After football practice Tina goes home and bathes. She does five maths sums before and after doing her homework. The sums are an extra-curricular activity that she is not required to do. After homework she eats her dinner and then helps her mother wash the dishes before falling into bed with her siblings.